From left to right: Ryley Dalshaug, Zhijun Liu, Robbin Rempel, David Fortosky, and Coach Brian Lane. 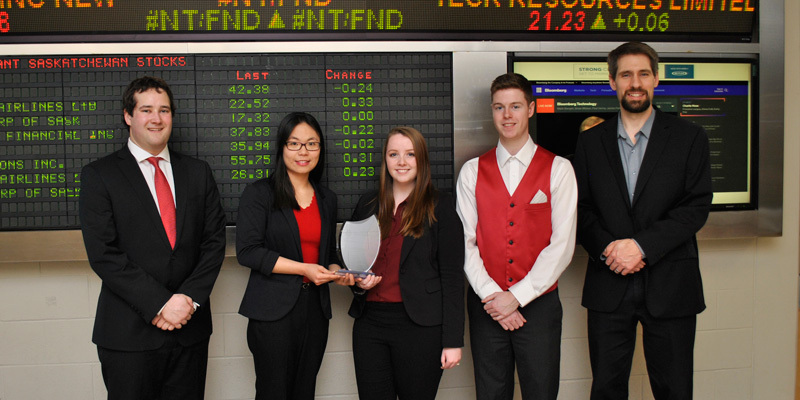 On Saturday, March 18th, four Edwards students competed in the inaugural Canadian CFA Society Ethics Challenge (Prairie Regional Division). Team members included Robbin Rempel, David Fortosky, Zhijun Liu, and Ryley Dalshaug. Edwards faculty member Brian Lane served as their coach. Hosted by CFA Society Winnipeg, the prairie regional ethics challenge included teams from the University of Saskatchewan, University of Winnipeg, University of Manitoba, and Mount Royal University. The Ethics Challenge focuses on the Society’s Future of Finance initiative and strives to prepare graduates entering the investment profession with ethical challenges they may encounter during the course of their career. Competing teams receive an ethics case to study and evaluate three months prior to the event. On the day of the challenge, teams have 10 minutes to present their analysis and recommendations to a judging panel of CFA charterholders. Following the presentations, each team participates in a 10 minute Q&A period with the judges, after which the winners are selected. The winner is selected based on the quality of the team’s understanding of the ethical issues involved, their recommendations, and the quality of their analysis, presentation, and responses to the judges’ questions. Congratulations to the Edwards student team and Professor Lane on finishing in first place at this competition! The team will now advance to the Canadian Ethics Challenge Finals to be held in Toronto on June 1st.